With the announcement about the transformation of ICONOMI’s corporate governance and the issuance of the eICN equity token, we have entered a new chapter. This is a a game changer for us and for our supporters, not just when it comes to providing legal clarity, but also for the new business opportunities that will arise as the traditional world moves closer to the crypto world. Two important aspects stand out from the business point of view: our internal treasury and a focus on B2C. We have announced that Pinta, previously managed by Columbus Capital, will be moved to the treasury. 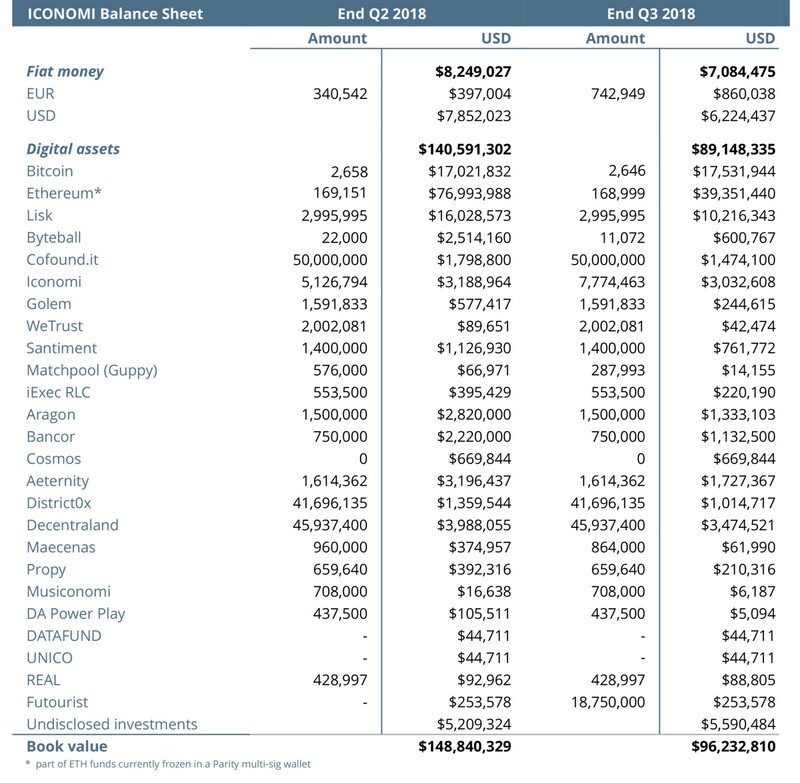 This can be seen in the balance sheet below, where all ICONOMI assets are shown in one table. With this move, we will also be ending the burning process; with the introduction of shares in ICONOMI AG and, later, the establishment of the eICN token, the General Assembly will decide how ICONOMI profits are distributed. In Q3, our book value decreased from $148.8M to $96.2M, mainly due to falling market prices. We decreased our positions in Byteball, Matchpool, Maecenas, and Ethereum, while we increased our position in ICN and made one investment that will be disclosed in the future. The path to our focus on B2C was as follows. First, we developed the platform, which meant, of course, that we had to have content — DAA managers and the first round of beta users. We have seen continued success with these aspects of ICONOMI. 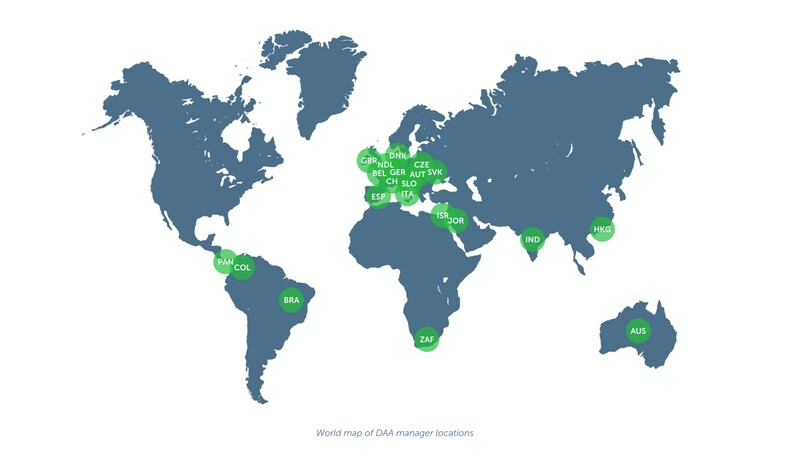 In Q3, we onboarded 3 new managers from Italy, India, and Brazil, for a total of 37 DAA managers from 21 different countries. Now we are facing a new challenge: onboarding more users to the platform. Currently, we have 61,627 users; most of them are more knowledgeable about crypto, since using the platform currently requires transferring digital assets to the ICONOMI platform from an external source. In summary, over the past year, our focus was more on onboarding DAA managers to ensure users had a wide range of options to choose from. Now, our focus will be more oriented toward rapidly increasing the number of platform users. So far, when approaching average users who may be looking to make their first crypto purchase, we had a challenge. We did not have a fiat gateway in place, resulting in our platform being difficult to use for those without experience in crypto. Many average users who were interested in investing in a diversified portfolio of digital assets gave up when they realized they would need to transfer bitcoin or ether to our platform from somewhere else. With the opening of the fiat gateway this year, this challenge will be largely overcome. This will also allow us to more aggressively market our services, which will of course have some impact on our costs. As shown in the table below, expenditures were lower in Q3, mainly due to lower salary costs, service costs, and others. The main expenditures still came from salary costs; we now have a team of 44. Besides our corporate governance transformation and eICN, we want to highlight a few main aspects of our business. Malta has shown itself to be the most forward-thinking jurisdiction when it comes to DLT, blockchain, cryptocurrencies, and tokens. Starting November 1, three relevant bills will come into force, establishing Malta as having one of the most advanced, robust, and clear legal frameworks in this regard. ICONOMI has been involved in this process from the very beginning. Our involvement began in September 2017, shortly followed by the incorporation of ICONOMI LTD in Malta in November 2017. We met with Maltese authorities in December 2017 to give a presentation of the ICONOMI platform. We have also had multiple meetings with the Malta Financial Services Authority, including a presentation of our self-regulation methods at which the Financial Intelligence Analysis Unit was also present. ICONOMI has earned a position as one of the key actors in setting up the Maltese legal framework, meeting with regulators and other key players numerous times and submitting our feedback on the majority of the MFSA’s and MDIA’s discussion papers. The next key step for ICONOMI in Malta is entering into a twelve-month transitory period, which we applied for last week. We aim to obtain the relevant licenses in that period of time, but even during this transitory period we will be able to offer products and services on the ICONOMI platform as if we were fully licensed. Our eligibility for entering the transitory period is the result of thorough research of different jurisdictions, making the right decision about which jurisdiction to choose, and more than a year of hard work. Only established businesses are able to enter the transitory period. We released our new trading engine in Q3, along with the rebalancing submission page to enable faster rebalancing. This gives DAA managers the option to play a more active role in DAA management. With the new trading engine, we want to explore new opportunities DAAs can offer and ways to add value to existing digital portfolios. We are also exploring more passive strategies, as with Delta Summit Index. Though we saw a strong impact from the crypto correction, we are still seeing big developments at the regulatory and infrastructure level. At the last few events we attended or exhibited at, the changing structure of the attendees and exhibitors was clearly apparent: fewer ICO projects, more traditional institutions. There was also more and more talk about security tokens, which we believe will be a big theme of 2019. These are signs that the ecosystem is maturing. One of our main focuses for Q4 will, of course, be eICN. We will be releasing the user interface and more information about the process of reserving your eICN on the ICONOMI platform or exchanging your ICN for Ethereum this week. Apart from eICN, our primary focus going forward will be growing our user base. One of the most effective ways we will achieve this is using the fiat gateway. In the past, anyone who wanted to use the ICONOMI platform had to transfer digital assets to their account from an external source. With the fiat gateway up and running, users will be able to do everything directly on our platform, from buying their first digital assets to diversifying into Digital Asset Arrays. We will also be releasing a complete redesign of our landing page before the end of the year. This revamp should also help improve our statistics. Finally, it is important both to look at the past and to look toward the future. Before the end of the year, we will be publishing both a review of ICONOMI’s progress in 2018 and an outline of our roadmap for 2019, similar to the roadmap we published for 2018.